There’s no denying that cats are excellent companions, but sometimes they do something that leaves you scratching your head in total confusion. If you’re used to dogs, cats’ social interactions and the way they communicate can be very confusing. Yet it’s these special behaviors, like affectionate head-butting and their penchant for cardboard boxes, that make us love them so much. 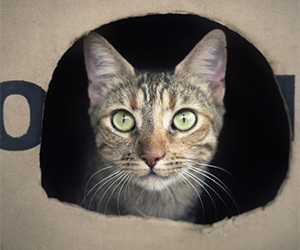 To help you better understand your elusive feline, we rounded up a few cat behaviors that people commonly consider mysterious. You’ll find that many of these habits aren’t weird at all for cats — they’re normal. When your kitty butts you with his head, it’s his way of saying, “Greetings, I trust you and feel safe.” It’s also one of his methods of sharing facial pheromones with you. Behaviorists actually call this curious behavior “bunting.” If your kitty doesn’t bunt, it’s nothing to worry about — he just might not be the head-butting type. Does your kitty “make biscuits”? Probably she’s content and happy, trying to alleviate anxiety or wants to mark you with her scent. The instinctive behavior begins shortly after birth, when kittens move their paws against their mother’s mammary glands to stimulate milk flow. If your kitten continues kneading as an adult, sit back and enjoy the massage. There are plenty of spacious and comfortable places your cat could sleep: your bed, the couch, a chair or even a plush pet bed placed on the floor just for him. So why does kitty choose an uncomfortable bathroom sink or small cubbyhole? Small spaces make cats feel more safe and secure. In the wild, felines need to be stealthy to survive, so sleeping in the middle of a wide-open field makes them susceptible to larger predators. Hiding in a small den, on the other hand, makes it more difficult for predators to find them. Like people, cats sometimes just need quiet “alone” time. When your cat is acting like he needs some space, let him have it. He’ll feel safer with you because he knows you respect that need. By allowing your cat to have his alone time, you’re setting the stage for him to come seek you out for some cuddles and lap time.